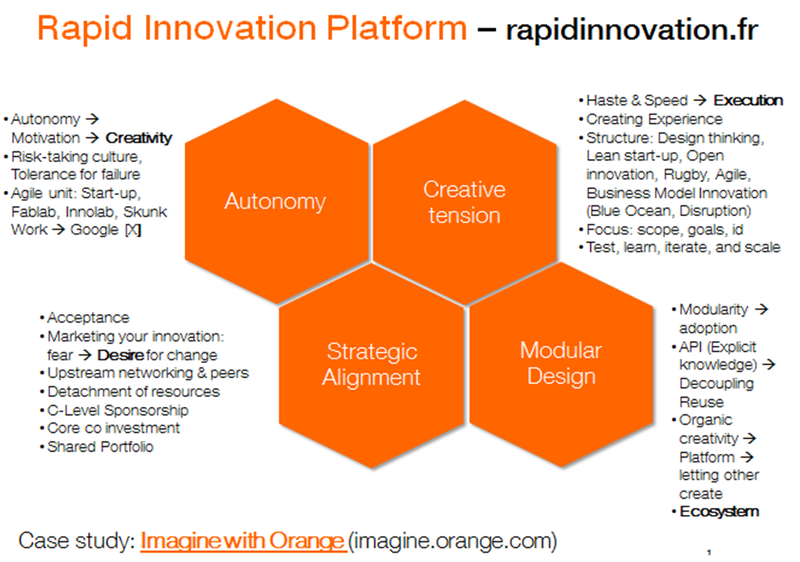 Following the description of the 1) Disruptive Labs, we move now to the 2) Rapid Innovation Labs. Speed is a sine qua non condition for customer attraction (due to increasingly rapid obsolescence) and agile iteration, to optimize relentlessly the customer experience: the second release of the iphone, which included 3G, was much more convincing tah the first release, based on low-speed network, for whats regards the Internet navigation. Modular design allows innovation to be split into modules. In the same way as APIs in IT, this design makes it possible for others to create value on top of your platform, and it creates an innovation capital that can be reused on several projects and thus allow an ecosystem to prosper. “We are defined not by the technologies we create but the process in which we create them.” Kelly Johnson, member and first team leader of the Lockheed Skunk Works. Skunk Works is the Advanced Development Program (ADP) division of Lockheed Martin. This internal organization aimed at stimulating the group’s innovation, and developing new technologies, particularly in the aerospace sector. Probably one of the oldest “Lab” (founded in 1943), the group remained famous for its capacity to innovate. Indeed, Skunk Works is at the origin of many famous planes such as the F-22. The division bases its operation on autonomy. Formerly led by Kelly Johnson, the Skunk Works unit is based on Kelly’s 14 rules. In a rapidly changing landscape, by focusing on its capabilities and experience in innovation, the group managed to provide its customers with cutting-edge technology, always more innovative in its chosen field, and at rapid pace. Lockheed Martin Skunk Works secret formula was the rapid development of disruptive solutions through high autonomy, and modular operations. Innovation within the O2 Enterprise Lab division is driven by strong values of speed and quality. The mobile phone industry has undergone many changes over the last decade. The competitive landscape has evolved to give way to players constantly seeking innovation capable of inventing new solutions quickly. Agility has become the watchword of this innovation center. The main objective here is the development of beta products to penetrate the market quickly. The center enables external players to test new products which, once selected, will move on to the industrialization phase. Once again, autonomy is a key enabler, and management remains very light. Thus, the objectives and strategy of the center are defined by the entity itself without any intervention from the parent company. Operation are therefore similar to those of a start-up. Ideas are prototyped quickly (a few days) after presentation and selection by the management team, according to defined criteria and available resources. To take an example of rapid innovation through this center, VOiP on mobile was deployed on the market in just 4 months under the O2 Connect brand. Openness is another key principle of O2 Enterprise Lab: open at the front end and in execution, open apis, open source, beta testing. 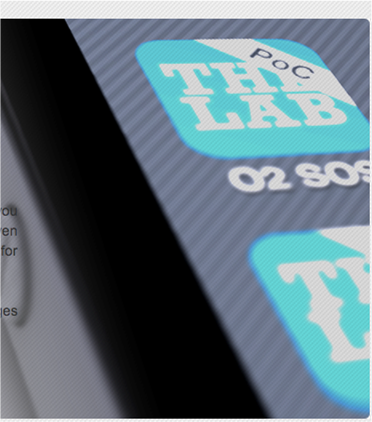 Openness is also necessary as O2 Lab lets others bring the product through industrialization. Mutual trust and progressive cooperation between core co and creative lab: to get buy in, it helped that it was a small change at first. Getting ‘buy in’ is not a push but a pull: creating desire first. The biggest challenge is definitely to bring back the creative product in the organisation; it require a shared ground among stakeholders. The birth of Airbus Protospace follows the threat of uberisation of the sector (Space X). Protospace can be defined as a corporate FabLab. It provides each employee with the necessary tools, collocating design and prototyping skills, and to create on the Skunk model, materializing quickly emerging concepts. Prototyping is therefore rapid. Similar to many centers, the management is close to the “startup” model, and openness is welcome whether through startups, universities or large companies to bring together diverse skills. As proof, 500 projects are born from Protospace since its creation in 2013. Successful initiatives include a solution for easy-installation of airplane seats, right-on time process for sharklets manufacturing, and an inspection drone. Speed is at the heart of the complex. Operating on an agile model, the team encourages to create and iterate according to its motto “Lead by Demonstration”. 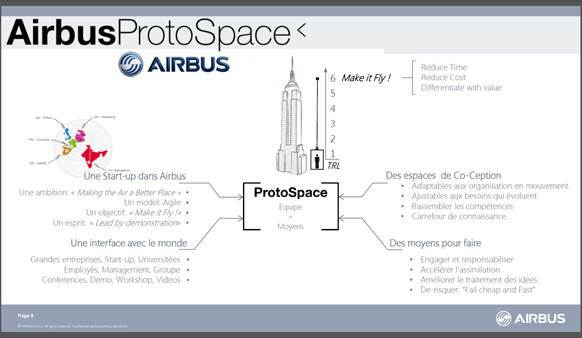 “Protospace is a a zone where ideas are assessed on facts, creative projects can be derisked, and failure is allowed.” claims Vincent Loubière, Lead Technologist in the Emerging Technologies and Concepts team at Airbus, Founder and Leader of Airbus ProtoSpace. Seb corporate Fab Lab ranks also in this category of innovation lab oriented toward accelaration.